Among the 12 sacred shrines of Lord Shiva known as the Jyotirlingams, the one nearest to me was the one which eluded me the longest! The 11 others are located all over India. The one I visited first was the farthest –Kedarnath, which is over 2000 Km away! Bhimashankar is barely 200 Km from Mumbai, and yet I had to wait for years. 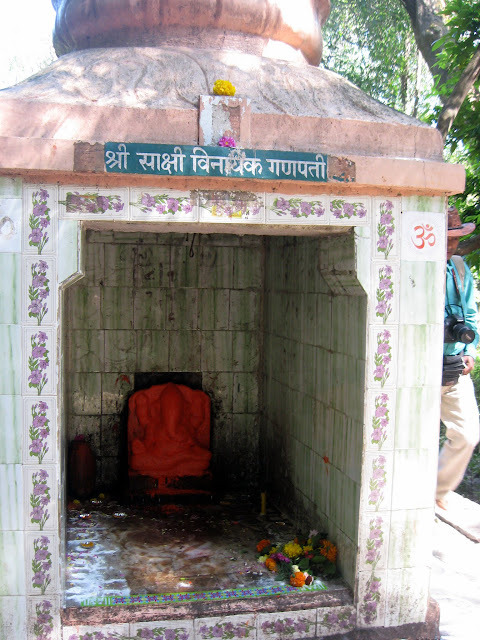 Bhimashankar gets its name from the two things that define its existence – the river Bhima, which originates here, and the temple of Shankar, or Shiva, which gives it importance. As with most temples, there are plenty of legends associated with this one too. 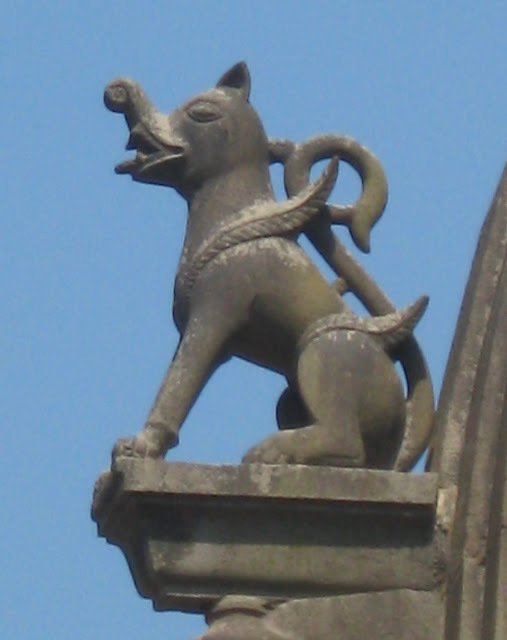 While some speak of Lord Shiva vanquishing the asura (demon) Tripura here, there are others which speak of the demon Bhima (not to be confused with the heroic Bheema of the Mahabharata). 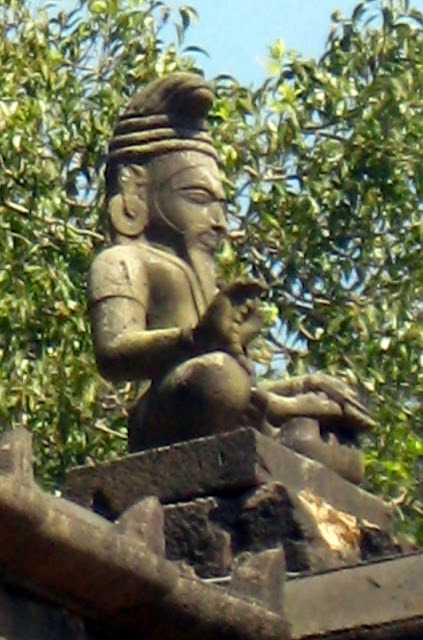 It is said that Bhima was the son of Kumbhakarna, the brother of Ravana. Bhima was brought up amidst these mountains by his mother, who kept her son ignorant of his lineage. When Bhima at last learnt of his father’s death at the hands of Rama, he was consumed by hatred for Lord Vishnu, and sought to kill the Lord. He prayed to Brahma and obtained boons which made him invincible; and wreaked havoc on earth and heaven alike. At last, gods and mortals begged Lord Shiva for help, who defeated the demon after a long and arduous battle. Bhima repented for his actions as he drew his last breath, and Shiva blessed him by staying on at this place, and joining the demon’s name to His. It is also said that the sweat of the Lord flowed as a river, and thus, the river Bhima was born. The temple is a simple and modest one, first constructed sometime in the 13th century. 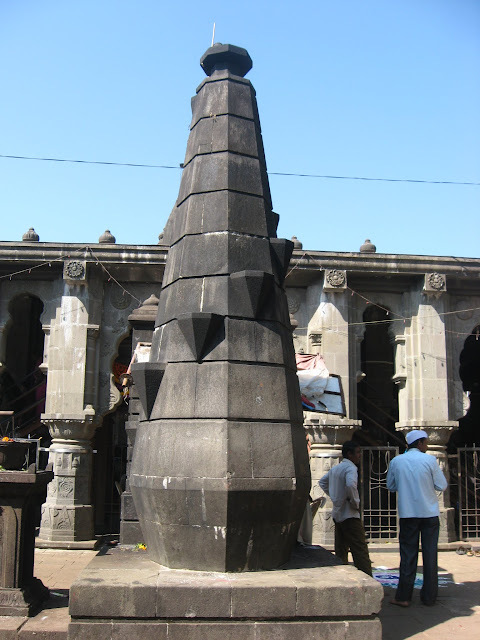 However, most of the present temple dates back to the 18th century when it was reconstructed by the Peshwas. 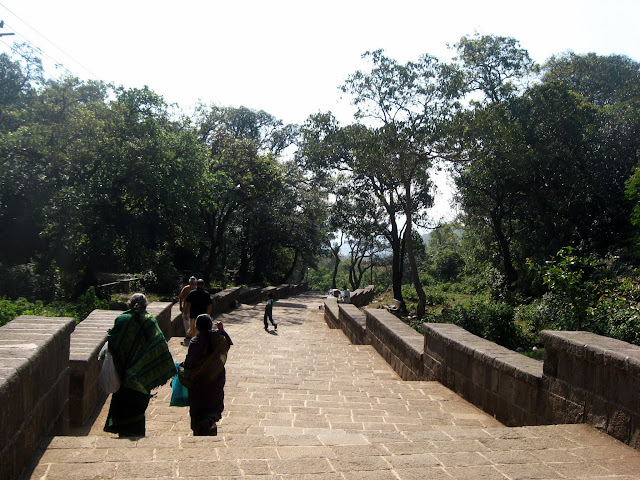 The village of Bhimashankar is situated at a higher level, and to reach the temple, we have to climb down a long flight of stairs. 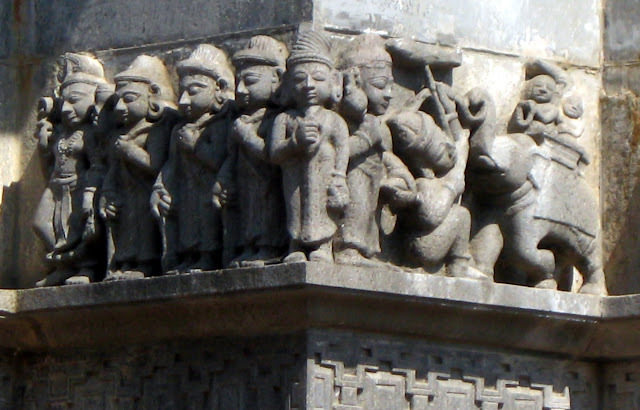 While the temple pillars and spire lack the intricate details seen in many other temples of the same period, there are quite a few detailed figures in stone all around the outer walls of the temple, representing both divine and human beings. 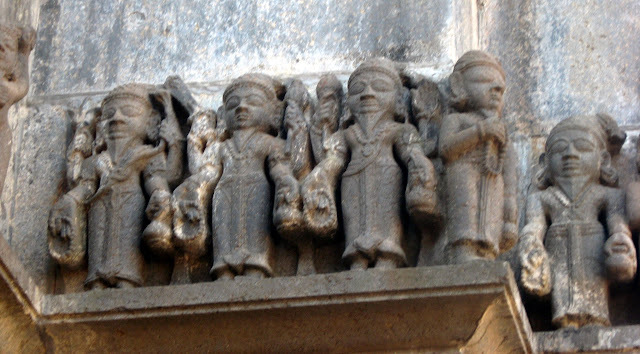 There are also figures depicting saints, probably representing some of the great ones who visited this temple in ancient times. Bhimashankar is most known as a place of pilgrimage, but its location amidst the dense Western Ghats makes it an ideal place for nature lovers as well as trekking enthusiasts. There are many trails around the temple, easy as well as tough. The trail leading to the origin of the Bhima river is a popular one, as is the one leading to the highest point of these hills, affording a wonderful view of the hills and valleys. We, however, could not try either of these, since I am not in any condition to trek. We did however; explore a little, taking the path to the place where the Bhimashankar lingam was originally found, at a spot on the banks of the Bhima, near its origin. 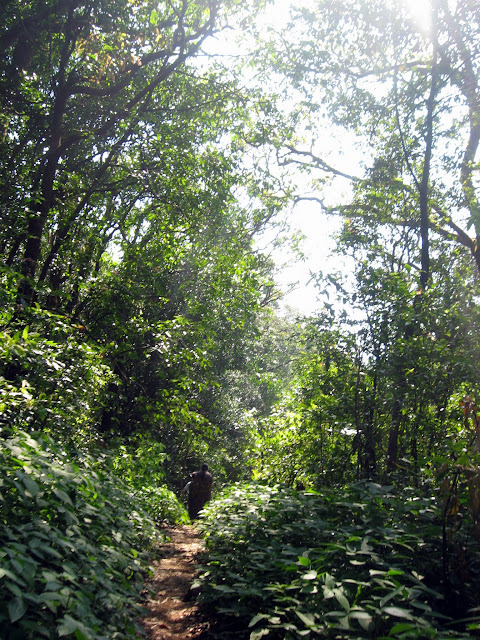 This place is called ‘Gupt Bhimashankar’, or the secret Bhimashankar, and the trek is a reasonably easy one, taking us through the dense forests of the Bhimashankar Wildlife sanctuary. These forests are home to the Malabar Giant Squirrels, but we were unable to spot any. If you go, tread quietly and keep an eye out for them! 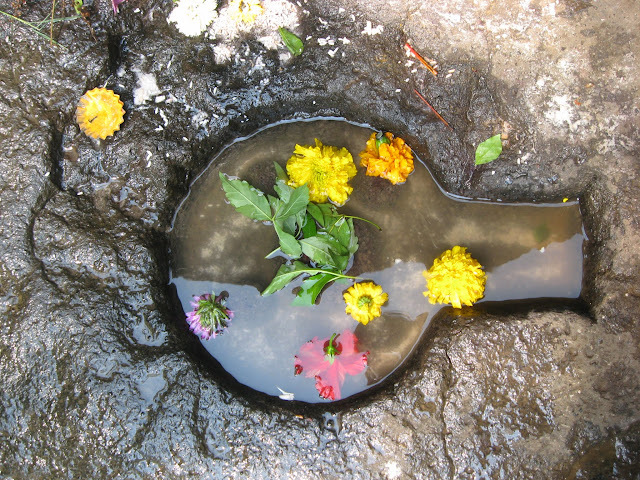 There is no shrine here, but simply a small Shiva Lingam on the rocks smoothed by the passage of water over the centuries. A little way further is a small shrine, to Lord Ganesh, who is called Sakshi Vinayak – the one who bears witness to our visit to this shrine! 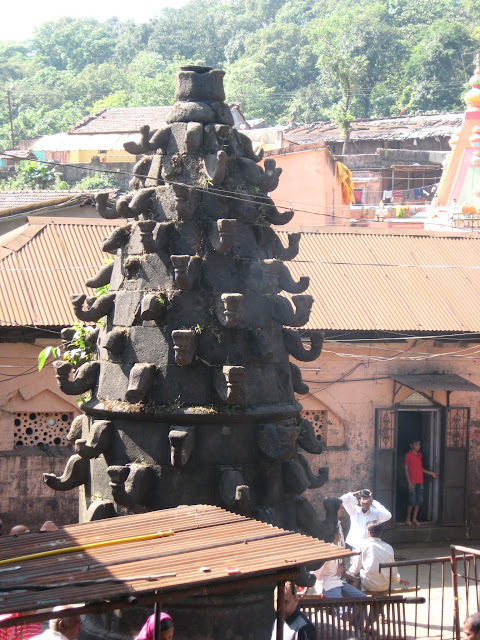 What I loved the most about Bhimashankar was the proximity of the temple to the forest. The village housing the temple is tiny, and most people who work at the shrine and in the shops around, are villagers, coming from even smaller villages located somewhere within these jungles. 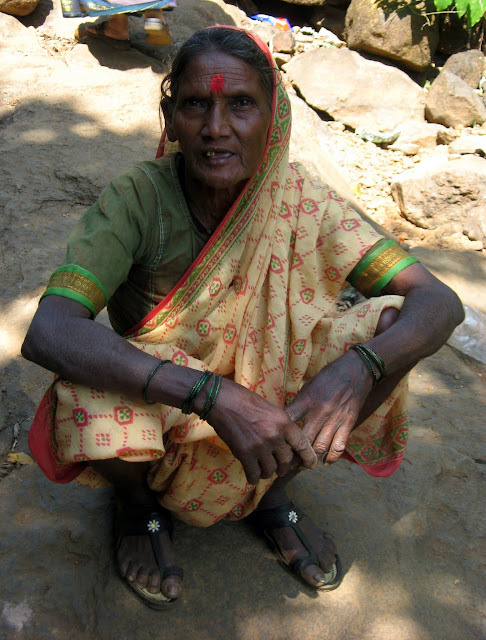 Our guide to Gupt Bhimashankar was one such woman, who sells medicinal herbs near the temple, and lives in a village somewhere near the foothills. She was an old woman, but walking through these forests was such a regular part of her life, she barely looked at the ground she was stepping on. We, on the other hand, had to frequently stop and clamber over some fallen tree trunk, pick our way up or down a steep incline or side step some manure! However, walking with her through that dense forest made this trip more interesting and memorable than just another temple visit! I wrote about them earlier, on Spice Flair, but it’s been a while now, and their story of faith is well worth repetition. 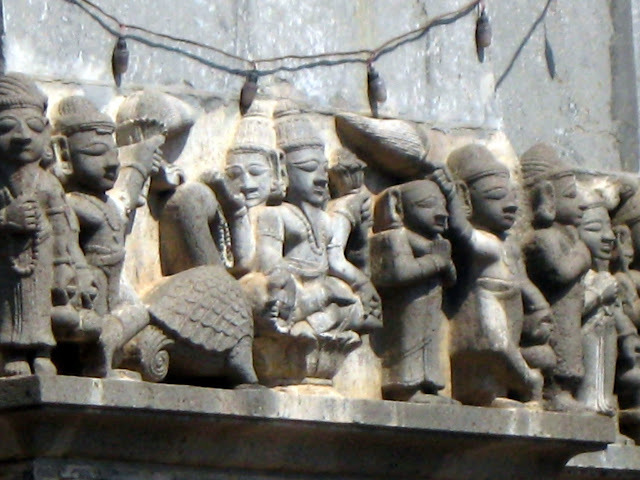 These are Kanwariyas – who bring water from sacred rivers to be offered to Lord Shiva. 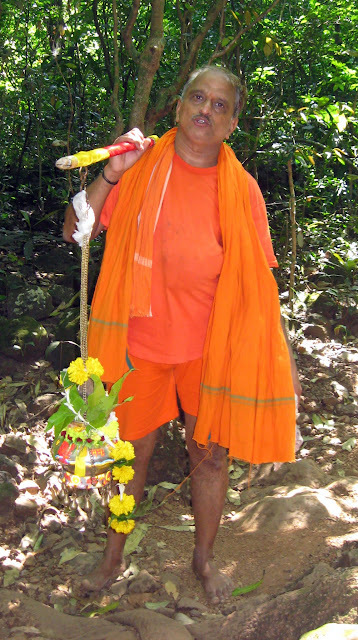 This is a common practice all over India, and Kanwariyas are most commonly seen in the north, where they carry water from the Ganga to shrines near their homes. They walk barefoot, wear simple clothes, mostly saffron in colour, and carry the water pots on their head or on their shoulders. They rest little during the journey, since they will not place the pot on the ground. The man we met was from a village on the foothills – he was an educated man, who toiled in a factory for a living, and worked as a priest in his spare time. Twice a year, however, he donned saffron robes and dropped all other work to carry water for the Lord – from the point of origin of the Bhima River, to the temple of Bhimashankar. This offering symbolised the very reason the temple existed – the victory of Shiva over the demon, and Bhima offering himself to the Lord. Exactly at noon, their offering reached the Lord, and their devout shouts resounded all over the mountains – Har Har Mahadev! Such is faith indeed. And it was then that the thought struck me – the Lord indeed had a reason for making me wait so long before calling me to visit this abode of His. He obviously wanted me to experience Him in a different light – not as an idol in stone, but as an entity who lives in the midst of nature, who lives in those who believe! By Air: The nearest airport is at Pune, though the international airport at Mumbai might be more convenient. 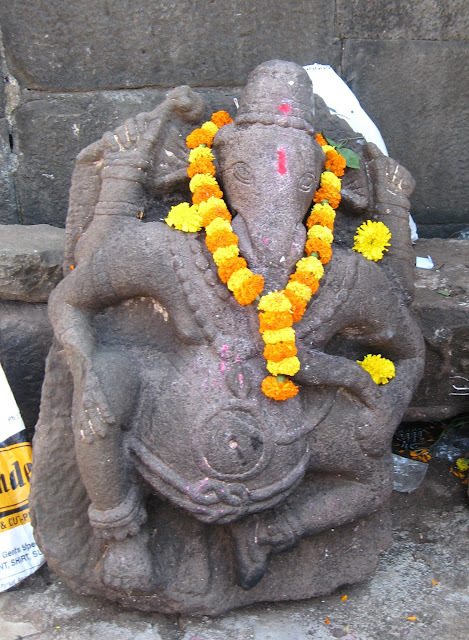 By Road: The best way to visit Bhimashankar is to hire a car from Mumbai or Pune. 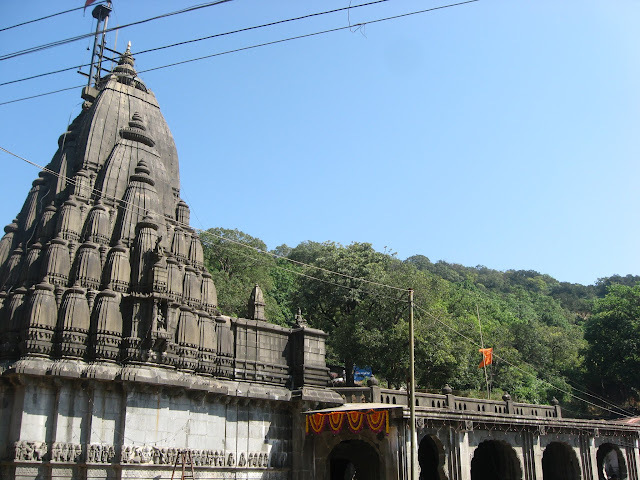 MSRTC runs buses from both cities, however, buses aren’t very convenient because of the location of the temple. They take too long a time to traverse the distance, and the frequency is not too good. 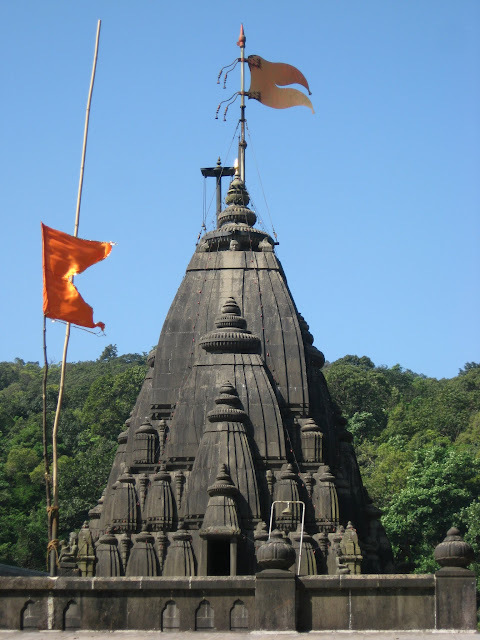 If you like to trek, it is easier and better to take a train to Karjat, and hike to the temple. There are two routes, both well used, but it is still advised to hire locals as guides. Where to stay : There is absolutely no provision for accommodation at Bhimashankar, unless you are able to persuade the priests or locals to allow you to stay in their houses. 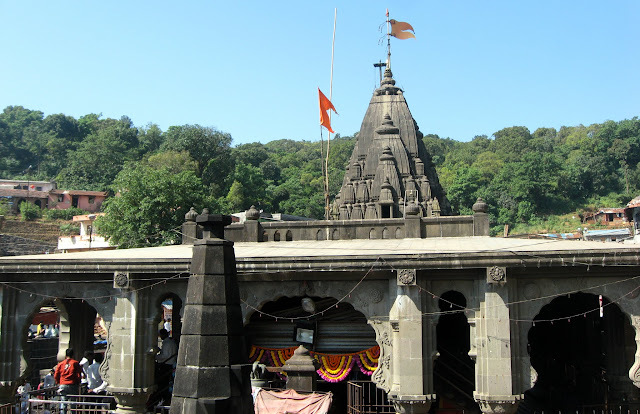 It is better to stay at Mumbai or Pune and make a day trip to the temple. comprehensive, is the right word, Deepak! thought of cutting it down, but couldnt!!! glad u liked it though! Wonderful pictures and description. I believe It is when Lord calls we reach his abode , otherwise whatever try we do to get there does not help. For me it was one of the best posts. My first jyotirling was Bhimashankar and that too by trek . I visited around 4 years ago when I didn 't know anything about bhakti much . Thanks so much, Vishal! I completely agree.. we can never visit any temple until he calls us! i have yet to trek to the temple, but have a son who wants to... who knows, if He calls again, and makes me walk, well! Very nice!! From the pictures, it looks like the crowds that we see in other Jyothirlingas are absent. Dear Anuradha Madam, When you have visited Bhimashankar? I mean, the date?? Yesterday, I have visited Bhimashankar along with my family and the rush was very heavy (Due to Shravan month), continuous rains and we could see Bhagawan's Mukh Darshan only. Hi, kindly tell us about sanitation facilities please. I plan to take my elderly parents there in next few months.